Music does not have to end with high school graduation. You are not required to be a music major to reap the benefits of a college music program. Compared to a high school program, colleges and universities can offer a much wider array of ensembles to play in, such as year-round orchestra, wind ensemble, chamber ensembles, jazz bands, show choir, theater ensembles as well as marching band and pep band. 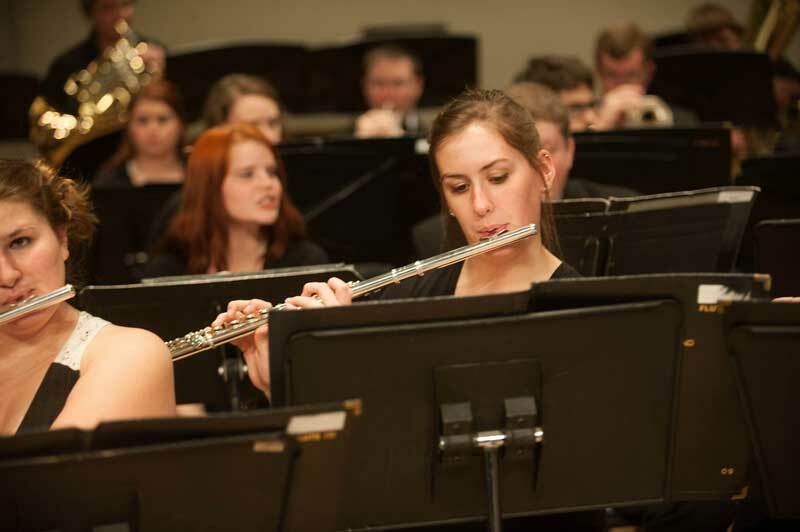 Performing music at the college level is a transformative experience. What makes the experience transformative is that most of the work and practice you put into it will be on your own. Almost all of your rehearsal time will be put into the music itself. Your group rehearsals may also be quite independent in terms of sectionals and other small group rehearsals. This time will challenge you to improve yourself without the supervision you might be used to. This gives you the opportunity to not only master your instrument and performance of music, but to make incredible lifetime friends! The independent study of music culminates in private lessons. University programs often make incredible private lessons available as a class where a student can work with some of the best musicians throughout the nation. While not teaching lessons, many of these performers will be with their respective symphonies and jazz ensembles. The great thing about university lessons is that are built into your class schedule—a prime benefit here is that the lessons can be more affordable than if you were paying for them on your own. Another benefit is that you can plan on working with your teacher weekly throughout your college career. For any student, college is a major investment. Thankfully, many universities will provide scholarships for students who play in its ensembles and there can be even more scholarships available for those who choose to major in music education and music performance. Generally, these scholarships will be awarded based on an audition. Many colleges actively pursue students who play less common instruments such as bassoon, oboe, horn, and tuba. Being proficient on one of these instruments can be advantageous in pursuing larger scholarship opportunities. There are many other scholarships available from private organizations and donors that you can pursue as well.